Sometimes you just need a volume knob. 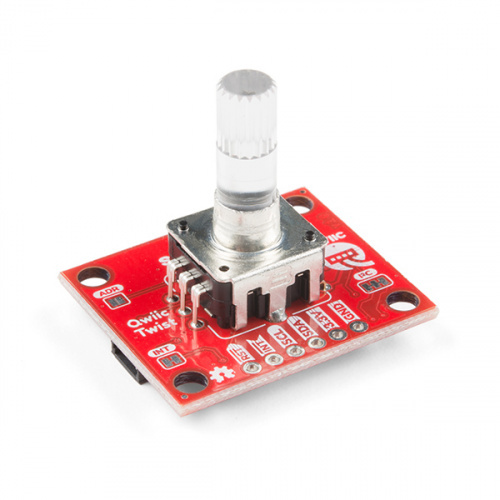 The Qwiic Twist is a digital RGB encoder, also known as a continuously rotating knob that is read and controlled over I2C. What does that mean? Send the command twist.getCount() and you’ll get the number of steps the user has twisted the knob. For example, 312 or -23 depending on the direction and amount the user and turned the knob. The Twist takes care of all the various interrupts, switches, PWM'ing of LEDs and presents all those features over an easy-to-use I2C interface. The Qwiic Twist was designed to get rid of the large mass of wires that are needed to implement an RGB encoder in a breadboard. Now you can get encoder position with something as twist.getCount(); and your microcontroller can keep focused on other more important tasks. And finally, the I2C address of Qwiic Twist is software configurable which means you can hookup over 100 Twists on a single I2C bus! To follow along with this hookup guide, you will need one of the following Qwiic shields with an Arduino. You may not need everything though depending on what you have. Add it to your cart, read through the guide, and adjust the cart as necessary. Tip: You could also use the SparkX BlackBoard. It's basically a RedBoard with additional features. This would reduce the amount of components and time soldering headers to the board. Keep in mind that SparkX products are rapidly produced to bring you the most cutting edge technology as it becomes available. SparkX products are tested but come with no guarantees. Live technical support is not available for SparkX products. You will also need a Qwiic cable to connect the shield to your Twist, choose a length that suits your needs. The Qwiic to breadboard cable is good if you want to easily plug the Qwiic Twist into a 3.3V platform such as Teensy. The Qwiic Twist is designed to be easily connected to a Qwiic bus without soldering. But if you choose to connect to the I2C pins directly you may need a soldering iron, solder, and general soldering accessories. We also recommend checking out these tutorials before continuing. 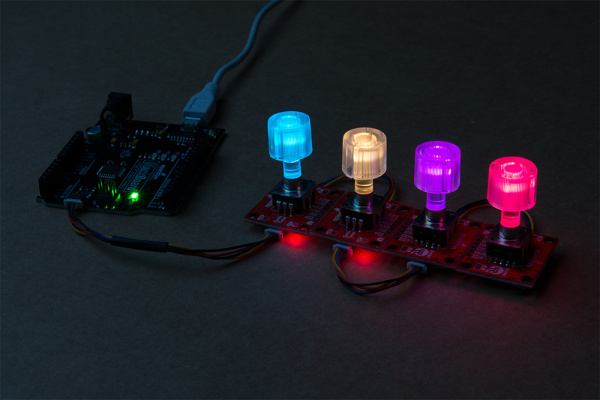 Get started with our Qwiic ecosystem with the Qwiic shield for Arduino or Photon. Additionally, we’ve got a great video on how the inner workings of encoders work and why they’re important.